The hymn which in the various rituals shares with Adon 'Olam the place of honor at the opening of the morning and the close of the evening service. 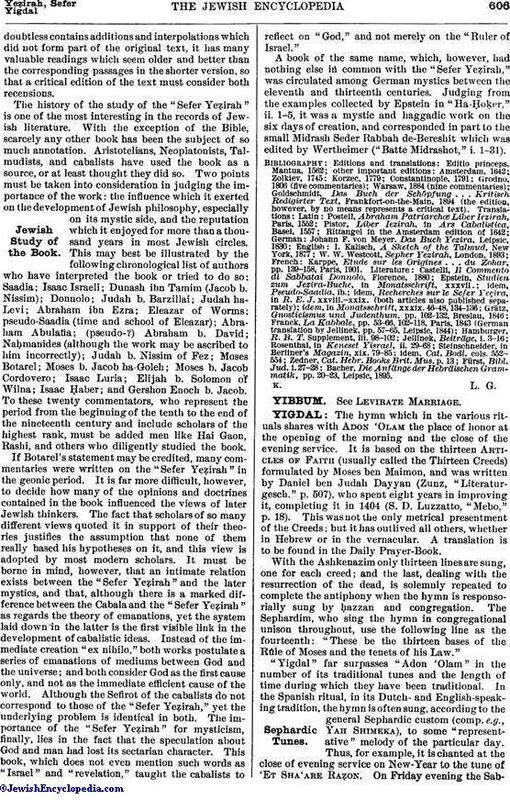 It is based on the thirteen Articles of Faith (usually called the Thirteen Creeds) formulated by Moses ben Maimon, and was written by Daniel ben Judah Dayyan (Zunz, "Literaturgesch." p. 507), who spent eight years in improving it, completing it in 1404 (S. D. Luzzatto, "Mebo," p. 18). This was not the only metrical presentment of the Creeds; but it has outlived all others, whether in Hebrew or in the vernacular. A translation is to be found in the Daily Prayer-Book. With the Ashkenazim only thirteen lines are sung, one for each creed; and the last, dealing with the resurrection of the dead, is solemnly repeated to complete the antiphony when the hymn is responsorially sung by ḥazzan and congregation. 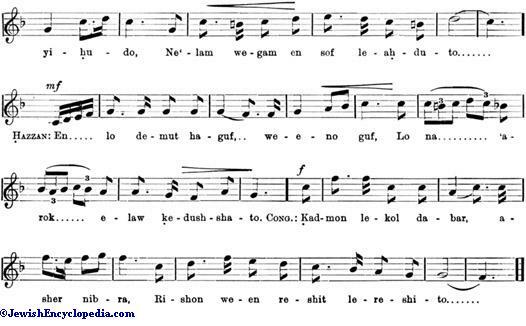 The Sephardim, who sing the hymn in congregational unison throughout, use the following line as the fourteenth: "These be the thirteen bases of the Rule of Moses and the tenets of his Law." "Yigdal" far surpasses "Adon 'Olam" in the number of its traditional tunes and the length of time during which they have been traditional. In the Spanish ritual, in its Dutch-and English-speaking tradition, the hymn is often sung, according to the general Sephardic custom (comp. e.g., Yah Shimeka), to some "representative" melody of the particular day. Thus, for example, it is chanted at the close of evening service on New-Year to the tune of 'Et Sha'are Raẓon. 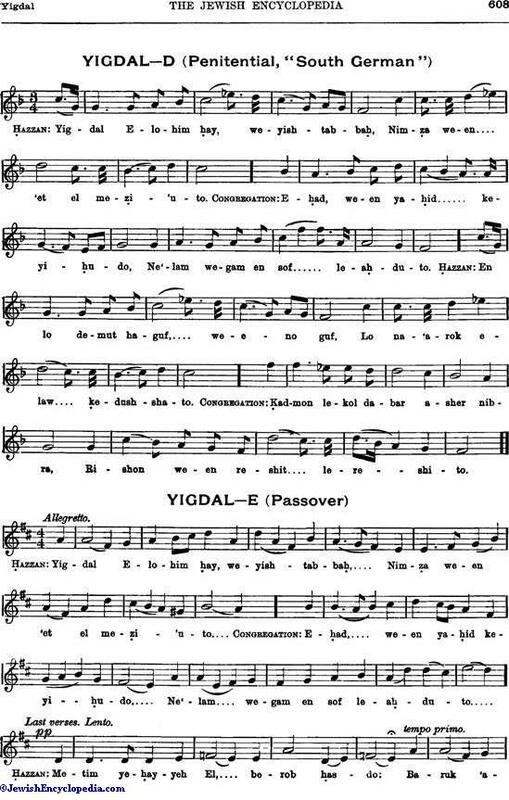 On Friday evening the Sabbath "Yigdal" is customarily sung to the same melody as are "Adon 'Olam" (see Jew. Encyc. i. 206, melody A) and En Kelohenu. On the three festivals the melody here transcribed under A is the tune favored. Its old Spanish character is evident. In the Ashkenazic ritual "Yigdal," though always commencing the morning prayer, is not invariably sung at the close of the evening service on Sabbaths and festivals, being often, especially in Germany, replaced by "Adon 'Olam." 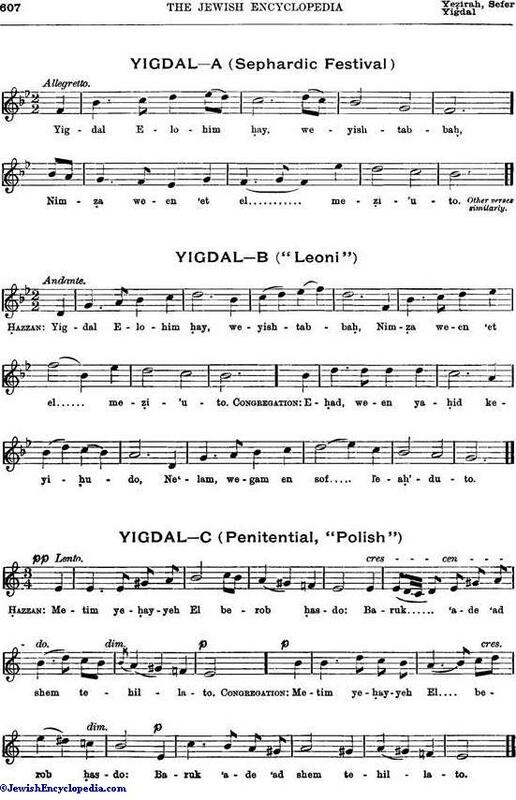 In Polish use, however, it is more regularly employed as the closing hymn, while in the synagogues of north-western Germany, Holland, and England, where the influence of the Sephardic ritual has been felt by that of the Ashkenazim, "Yigdal" is considered an integral portion of the Sabbath and festal evening prayer; and in London for fully two centuries there has been allotted to the hymn, according to the occasion, a definite tradition of tunes, all of which are antiphonal between ḥazzan and congregation. The most familiar of these tunes is the Friday evening "Yigdal," transcribed here under B. It has passed into the repertory of the Anglican and Nonconformist churches under the title of "Leoni" (see Jew. Encyc. viii. 229). It is utilized also in Germany and in some parts of Poland and Bohemia as a festival "Yigdal." The melody may date from the seventeenth century or perhaps earlier. Next in importance comes the beautiful and plaintive air reserved for the solemn evenings of New-Year and Atonement, and introduced, in the spirit of Ps. cxxxvii. 6, into the service of the Rejoicing of the Law. This melody, here transcribed under C, is constructed in the Oriental chromatic scale (EFG # ABCD # E) with its two augmented seconds (see Music, Synagogal), and is the inspiration of some Polish precentor, dating perhaps from the early seventeenth century, and certainly having spread westward from the Slavonic region. In the German use of Bavaria and the Rhineland the old tradition has preserved a contrasting "Yigdal" for New-Year and Atonement that is of equally antique character, but built on a diatonic scale and reminiscent of the morning service of the day. This interesting melody is here transcribed under D.
For the evenings of the three festivals the old London tradition has preserved, from at least the early eighteenth century, three characteristic melodies, probably brought from north Germany or Bohemia. 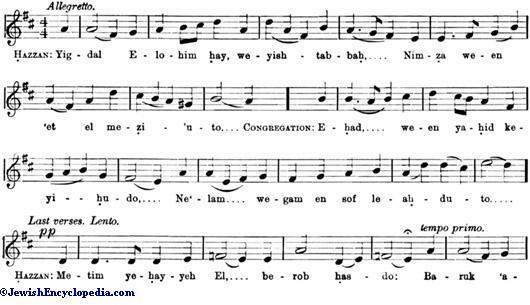 That for the Passover, here transcribed under E, illustrates the old custom according to which the precentor solemnly dwells on the last creed, that on the resurrection of the dead (in this case to a "representative" theme common to Passover and to Purim), and is answered by the choristers with an expression of confident assurance. The choral response here given received its final shaping from Mombach. 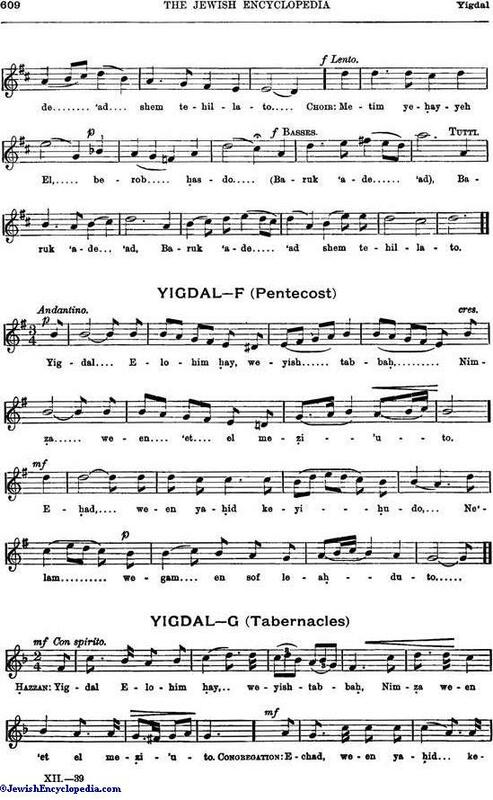 The "Yigdal" for Pentecost, transcribed under F, is of a solemn tone, thus strikingly contrasting with those for the other festivals. 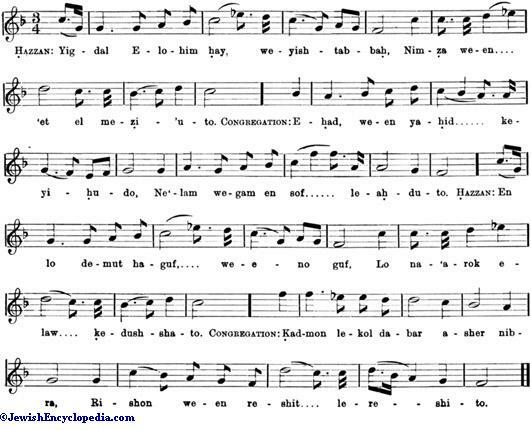 The tune for Tabernacles, here transcribed under G, displays a gaiety quite rare in synagogal melody. 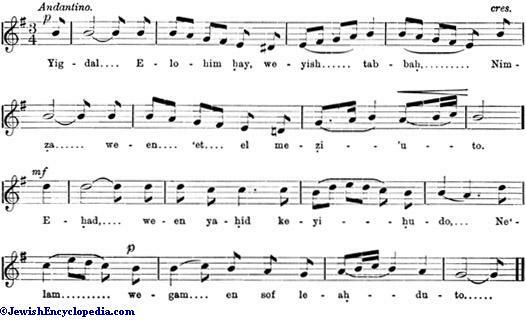 It was employed by Isaac Nathan, in 1815, as the air for one of Lord Byron's "Hebrew Melodies," being set by him to the verses "The Wild Gazelle" in such a manner as to utilize the contrasting theme then chanted by the ḥazzan to the last line as in the Passover "Yigdal." 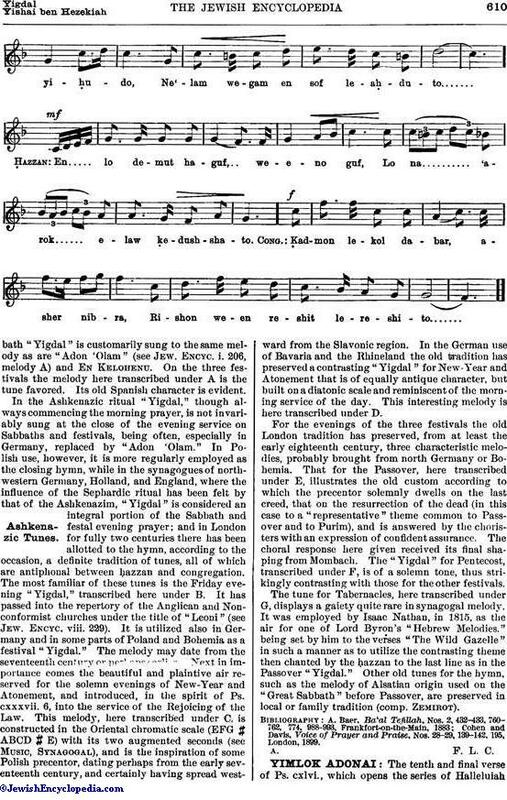 Other old tunes for the hymn, such as the melody of Alsatian origin used on the "Great Sabbath" before Passover, are preserved in local or family tradition (comp. Zemirot).